ASP.NET "Razor" Web Pages are ASP.NET sites without models, views, controllers, or project files. Some folks say "oh, that's just Classic ASP, or PHP right? Not at all. It's the full power and speed of the .NET CLR, the full syntax of C#, LINQ, along with things like C# dynamics. It's super powerful, and my friend Mads and I are surprised more people don't use them for small things. In fact, Rob Conery and I did the http://thisdeveloperslife.com web site using just Razor and Rob's "massive" micro-ORM. Later I made http://hanselminutes.com with Web Pages as well. This blog runs DasBlog, an older ASP.NET 2.0 blogging engine I worked on with Clemens Vasters and a lot of co-contributors, but I'm actively checking on Mads' MiniBlog, a minimal but VERY competent blog engine using Razor Web Pages. Why wouldn't I use something like Ghost? I've thought about it, but MiniBlog is SO minimal and that makes it very attractive. Here's some things I like about MiniBlog, as both a blog and a learning tool. Blogs do more than just serve pages, there is also a need for RSS feeds, MetaWeblog Web Services for things like Windows Live Writer, and dynamic minification for JS and CSS. I like apps that can avoid using databases. Sometimes the file system is a fine database. I thought this when we worked on DasBlog, Mads thought it when he made BlogEngine.NET (his original blog engine) and that "no database needed" design tenet continues with MiniBlog. It stores its files in XML, but MiniBlog could just as easily use JSON. 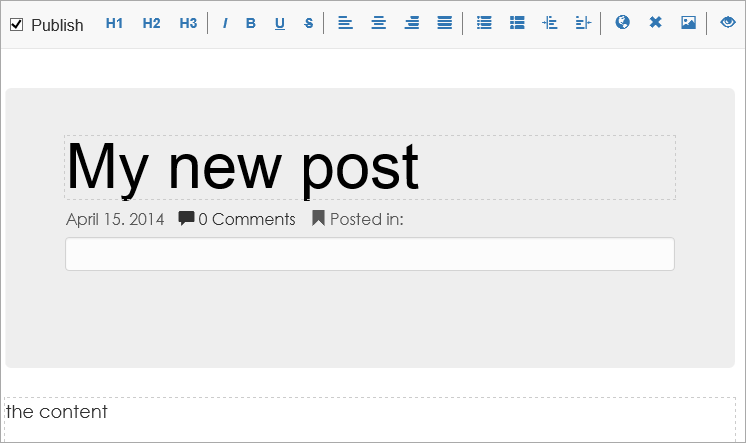 When you are viewing a post while logged in as Admin, you click Edit and turn the page into editable content. It even automatically optimizes images you drag and drop into the design surface and upload. The code is fun to read, and you can go check it out at https://github.com/madskristensen/MiniBlog. It supports HTML5 microdata, sitemaps, both RSS and Atom, simple theming, and gets a 100/100 of Google Page Speed. This is pretty cool. I really like Web Pages and am surprised more people don't use it to create simple web sites. It beats WebForms and MVC when it comes to simplicity and learning curve. scott , fantastic. any idea if Mads is thinking of providing some guide lines on how to migrate from Wordpress to miniblog ? Actually by moving the application logic behind API the only really valuable thing in .NET-based UI is the ability to use the MasterPage (WebForms) or ViewMasterPage (MVC) - to keep all common stuff like general page layout, CSS/JS/etc. links in one place. I've been meaning to try to do that but just didn't have the time. Anybody tried? I migrated from Blogengine.net to miniblog a while ago and the performance is impressive. Web Pages and Razor are fast and super light weight. I used it to build Career Voyage and it has performed flawlessly for the past year with over 4 million page views by 50K+ users. Its the hidden gem of the ASP.NET stack!! Razor Pages are awesome. I used them along with Webmatrix to write my own 'blog engine' called BlogMatrix. I've just tried connecting Writer to MiniBlog, but its coming back saying it cant find the template and asking me to choose which blogging platform it is. Anyone else have this, or know which URL its after? After looking some more, to get Writer to 'see' the blog. The Remote Posting Url was "http://blogaddress/metaweblog"
That is sweet! Hard to beat Mads, but a blog engine to watch is sblog. The author doesn't seem to have much love yet. But it beats the others I've played around with. Too bad I didn't hear about it before starting my blog this winter, the Razor engine is great to work with. Wordpress has a lot of features, but it's overkill for many projects. Do you know if miniblog supports arbitrary standalone pages? I'm currently using Orchard, which is a fine CMS, but arguably overkill for a blog, and I find myself longing for something simpler. Anyone else on Orchard want to work together on a formatter to export Orchard content to miniblog? Razor, WebPages, ASP, ASP MVC, LightSwitch, WebMatrix, etc. etc. By the time I learn the names and what they do and how they connect, Microsoft renames them all and I have to start all over again! Highly interested in building with this tool to support some podcasting I plan to do. Will be grabbing the bits tonight. Does it support LESS/SASS? I migrated from Blogger to MiniBlog a few months ago. I was about to write something myself (something lightweight and built with MVC). But then I found MiniBlog and it's been a perfect fit. I like that it works with Windows Live Writer. You can easily use LESS or Sass with MiniBlog if you use Web Essentials or any other VS extension that can compile it. On my blog, which also runs MiniBlog, I've made such modifications. For instance, I don't use the minification HttpHandler, but instead uses Web Essentials for both bundling and minification. I fully appreciate the irony, and I also appreciate all the hard work you've put into Orchard. It's a tough balance between feature-richness and complexity vs. simplicity. Checkout MvcPages, MVC without routes and controllers, or WebPages with Model Binding, Model Validation, Editor/Display Templates, strongly-typed HTML helpers, TempData, etc. Can I just drop in the BlogEngine.Net XML file(Posts) into MiniBlog? I also love to use plain .cshtml files for 'general' html pages that need a few small server side commands embedded and using Razor instead of the WebForms syntax is definitely way nicer. However, one reason I don't use .cshtml as much as I should is that it's not automatically configured. For example, when distributing demos or NuGet packages, you can't be assured that .cshtml just runs. You have to specify the <appSettings> keys to specify that WebPages are enabled and worse - you have to specify the version. Plus you may have to add additional NuGet packages to get the right version of WebPages installed. Compared to ASPX which is just there and works that's can be a pain for casual use. I'd love to see .cshtml work the same as ASPX does without required configuraiton. While trying to create a new post. anything wrong ? ASP.NET Web Pages sound very cool. So, how do I add ASP.NET Web Pages to an existing MVC application that uses .net 4.5? I'm having the same trouble James was. I am brand new to blogging, just downloaded the code and published directly to azure. When attempting to connect WLW to the site, I'm told by WLW that it can't automatically detect my blog settings and I need to select one from the list (upon which miniBlog is *not* on said list) and to provide the "Remote Posting URL" whatever that is. Can someone lend a little guidance here for a newby? Figured it out! For WLW, select "Metaweblog API" from the drop down and then add "metaweblog" to the end of your url for the Remote Posting URL e.g. "http://mynewblog.azurewebsites.net/metaweblog" and then WLW should pick it up. I would like to install MiniBlog as a component of my existing ASP.NET MVC Web Application. I have asked about this on StackOverflow here. How would you integrate MiniBlog as a module of an existing Web App? My sense is that ASP.NET MVC Areas might be a good approach. I'm not sure, though, how to place an existing Web Site into an Area. It's pretty awesome, I would only add markdown support since it has nice built in code highlighting. MiniBlog with Ghost Editor: link. It's really very nice idea.I liked these pretty ideas about ASP.NET.If you want to get more knowledge about ASP.NET you can visit myasp.net.